From goodreads: Stella’s future was set, and it was a bright one. She was engaged to a man she adored, and was headed to law school in the fall. Tragically, her perfectly planned future ends just as it was beginning. With no ties to family or friends, Stella finds herself alone in a new city, spiraling out of control. Her typical day comes to a close with her passed out on the floor; sometimes clothed. Luckily, her new roommate, essentially a stranger, is dead set on getting Stella past her grief and back to functioning within society. Putting one foot in front of the other, she climbs up from the bottom of a bottle. Even with all her progress, Stella walks through life unfeeling, numb. Defiant, she sends out warning signals for the world to keep away. But, is that what she really wants? With the steadfast help of a few tight knit friends, she gradually begins to feel again. She starts to savor the flavor of food again; lets herself notice how the handsome bartender glances at her. Still, after allowing herself a fling, she wonders if she will ever be able to let go of her shattered past, fully enjoy the present, or get over what she thought would be her perfect future and with the man who destroyed her heart. 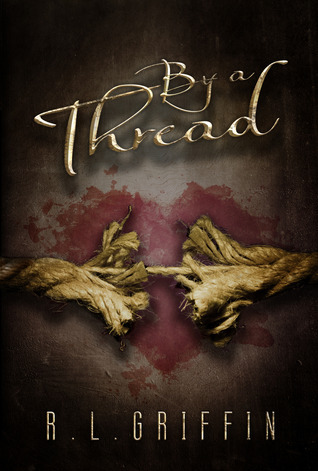 By a Thread is definitely a different read and it’s totally up my alley. This is romance-suspense at its finest and it will keep you guessing the entire time. The story starts out with Stella and Jamie who met during college and they fall in love. But then Stella is met with a tragedy that she barely recovers from. She was on a path to pure self-destruction because of everything she just endured and there are so many cringe-worthy moments that I was uncomfortable for at least the first half of the book. I absolutely loved Stella’s roommates (Patrick and Billie) who take care of her, they can handle that she’s beyond depressed and most importantly they can tolerate all the insults she spits out on a daily basis. Normally we don’t see the heroine spiral out of control and binge drink every day, so I found that to be refreshing in a weird way because it’s always the male characters that are allowed to do that…I say, BRAVO! She was fantastic and I experienced every emotion she felt! Stella slowly starts to recover and then she meets George, the amazing and fabulous George. George had the patience of a saint and I loved how he dealt with Stella’s surliness. Their attraction was palpable but it wasn’t insta-love because she was so incredibly broken that she wouldn’t allow herself to feel but eventually those barriers started to crumble, thank god! The only issue I had with the book was the ending, there were so many unanswered questions and it almost felt rushed. There wasn’t a cliffhanger but so much was left unresolved for Stella but I’ve been told there will be a sequel which I’m hoping will satisfy all the unanswered questions I have. Overall, this is a fantastic story with excellent writing. Now I’m on the hunt to see what I can find out about book 2! You got nominated twice too! Such a badass! Christina- Thank you so much for the review. Tension is the second book and it comes out August 1. Thank you for stopping by my blog to let me know!!! I’m now officially dying for that book!! !